The music program at Chase Manning's school is about to be cut unless they can earn enough money in the Spring Fling Auction to keep it going. A prized cello is donated to the school for the auction. Hopes are high that the auction price for the cello will be enough. When the cello is stolen the day of the auction, Chase must solve the mystery surrounding the disappearance. 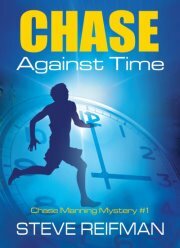 In Chase Against time, Chase Manning Mystery #1, author, Steve Reifman, builds tension and excitement by having the action take place over a short amount of time. The school setting makes the story easy to relate to the target ages of 8-12. Chase is a likable detective who children will want to follow through a series. Recommended, though I think the series will appeal to the mid range of the suggested age more than the upper end. I was reminded of the Encyclopedia Brown series I read as a child. The Chase Manning series will appeal to the reader who likes these types of detective mysteries. **Disclosure: I received an electronic copy of the book at no charge from the author. This in no way influenced my opinion of the book. I give honest reviews based on my own opinions. Contest Details: To win a copy of this book, use the Rafflecopter form. Please read the disclosure on the Rafflecopter form. By entering the contest, you agree to have your name published on the blog as the winner. Information collected by form is not sold. Contest ends March 18, 2012 at 12:01 EST. I live near the beach so the, Beach T-Shirt for Men: “GoneReading” struck a chord with me. My son would love the adventure in this book. it's about another music lover! I learned it's about another music lover!